… and I have a problem. 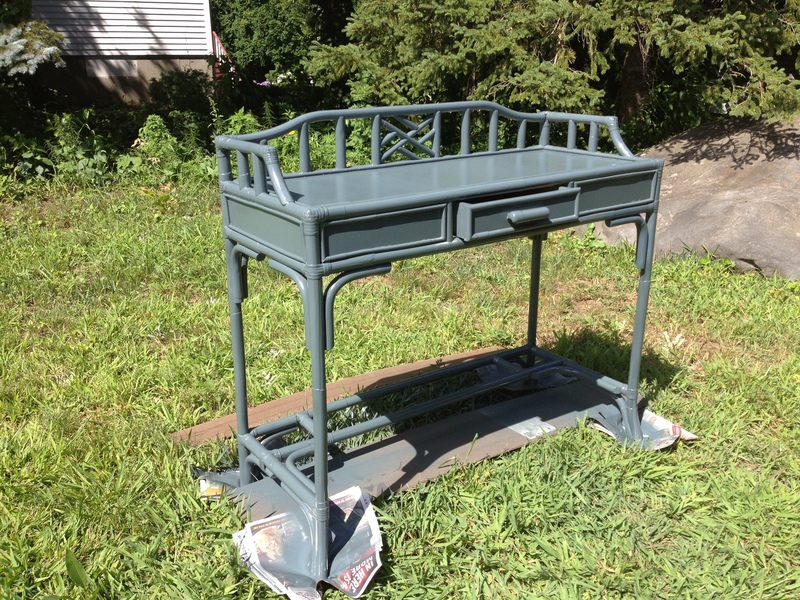 Specifically, I have a thing for trolling Craigslist for pieces that are under fifty bucks, could benefit from some paint or stain, and are solid classic designs. And man, have I been lucky. It all started when we realized (ok, I realized and told Steve) that we had a severe lack of useful furniture in our guest rooms. Yes, guest roomS. Our house has three bedrooms. We occupy one, and empty beds occupy the other two. With no plans for people joining this family to fill said rooms for some time (sorry Nana), they are presently guest rooms. Or, dressing rooms. And an office. And a room for Roomba to be plugged in and sleep. Anyway, there are two other bedrooms: a big one, and a little one. The big one is the same size as our bedroom, the small one is about half that size. The big guest room has always had a queen size bed/headboard, a nightstand with two drawers (the headboard and nightstand are part of the set we split up–we have the dresser and bureau/mirror in our bedroom), and a director’s chair. And that was it. Period. Nothing else. Well, there were some lamps and an iHome on the floor in the corner, which, as we all know, is the proper way to welcome guests into your home. 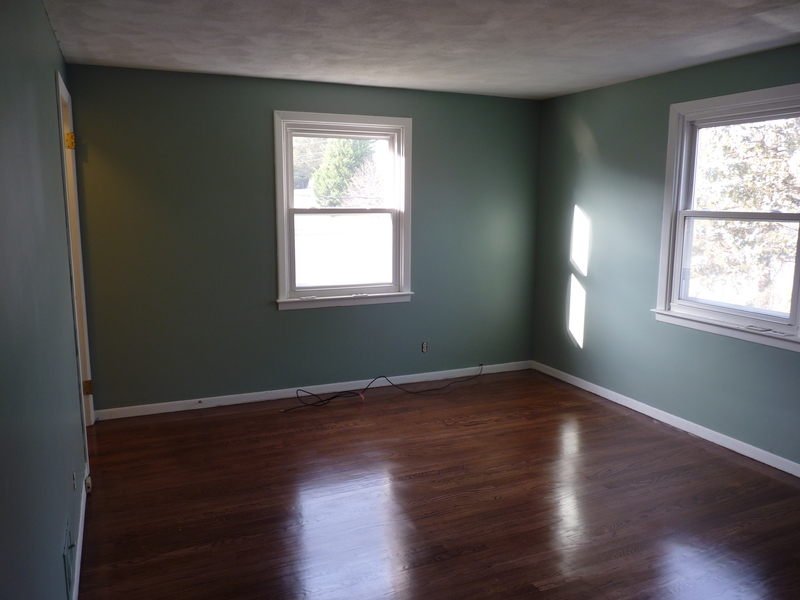 This is the room, empty as can be, right after the paint and floors were done way back in December. The bigger guest room, painted MS’s Milk Pail green. The smaller bedroom is actually quite full, but it would take an overrun of guests for us to actually stick someone in there. So, we sort of don’t care. 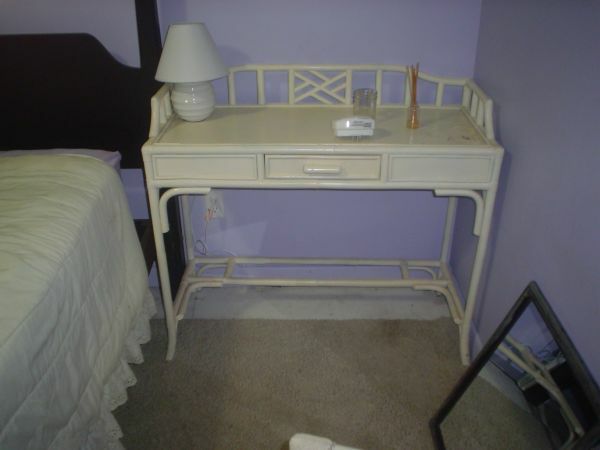 It has a twin bed with an upholstered headboard, a desk, filing cabinet, and a tall bookcase. The tall bookcase is a big MDF-and-paper-veneer behemoth left over from when my parents bought their house (…before I was born), but it is solid and we needed some storage, so we took it. It will likely move to the basement eventually, leaving a big gap in space and storage in the small room. The bigger guest room is the one that has gotten me into trouble on Craigslist, as there was a more pressing need to add useful and stylish storage. So we decided that we’d need a dresser, a vanity or sideboard-type console table, and an ottoman or something that guests could put a suitcase, etc. on. We wanted this room to be very comfortable, but look rustic-ish and exude a camping-gone-five-star theme. Watch Dirty Dancing, Moonrise Kingdom, and Dan In Real Life in rapid succession, and you should get the idea. We were able to find a great ottoman at Home Goods, so that was easy. But then the Craigslist search began. I struck gold right away. And by “struck gold,” I, of course, mean that I found a school-bus-yellow dresser with great bones and awesome hardware that I just had to have. Steve liked it, with the caveat that it had to be painted. Duh, I’m with you there. When we went to pick it up, we were charmed. The young woman who sold it to us was cleaning out her parents’ home–her childhood home–and the dresser had been hers as a child. Her father was stationed in Japan when she was a little girl, and he had the dresser made for her in Japan. This made sense: it was a great combination of campaign and tansu style. There were the telltale corner brackets of campaign dressers, along with gorgeous hand-forged wrought iron tansu pulls. It was something special. And it was thirty bucks. 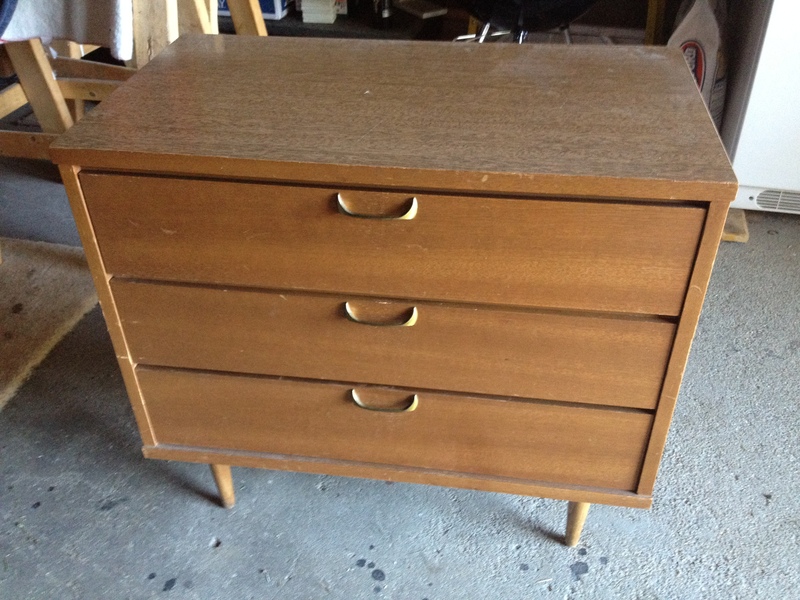 I sadly don’t have any photos of the before on this dresser, but you can just imagine when you see the afters. 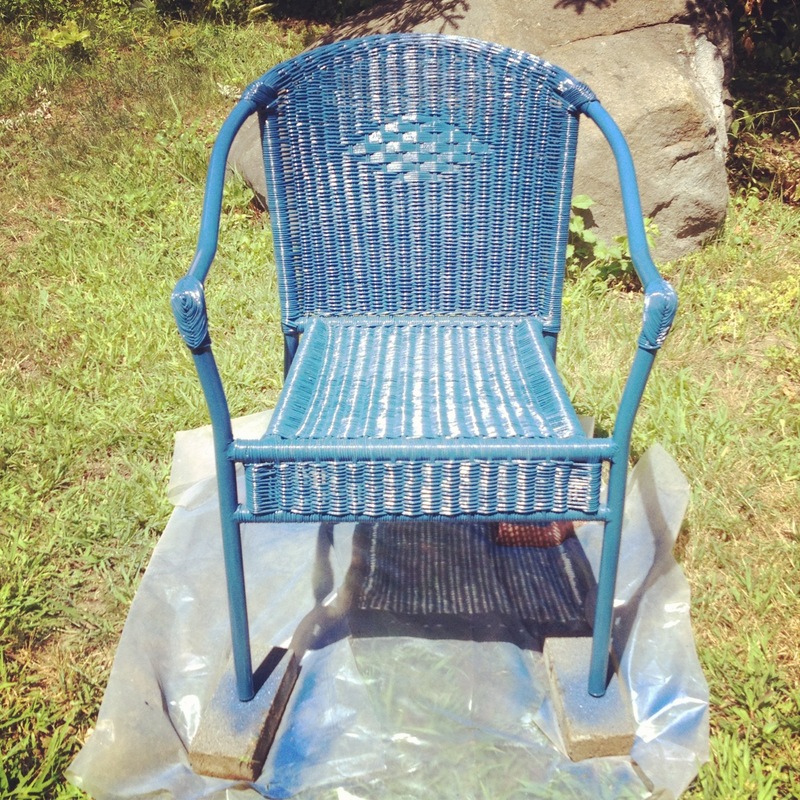 Armed with a tutorial (google Centsational spray paint) on how to spray paint furniture, a ton of spray paint (Kilz primer, Valspar satin Thorny Brush) and a can of Minwax Polycrylic, I started. And this, my friends, is the gawgeous shiny finished product. Like I said, imagine it screaming matte yellow. Reattaching that hardware was a beast. I’m insanely proud of it. There are some spots where the yellow shows, like around the handles. 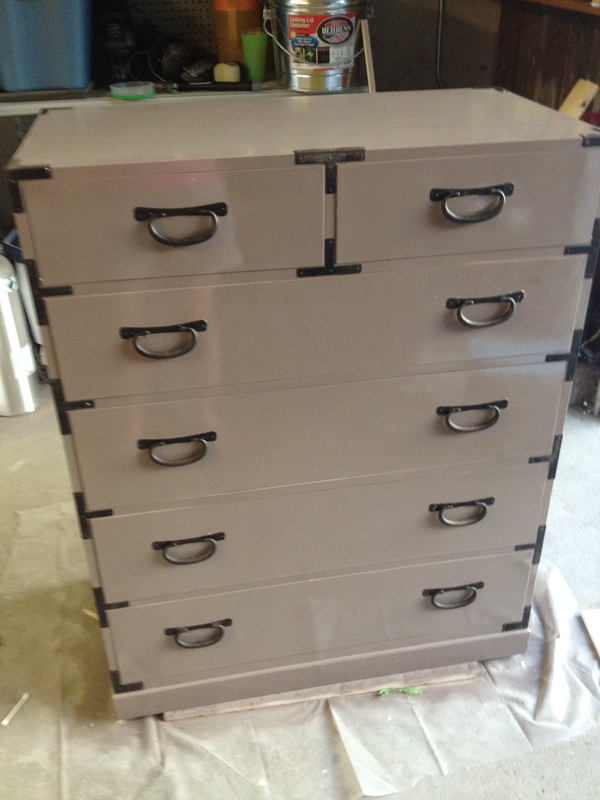 The corner brackets all came off for the painting process, but the tansu handles couldn’t be removed. So I taped the handles in an upright position and covered the brackets behind the pulls in vaseline with Q-Tips. Gloopy and gloppy, but it worked like a charm. Like I said before, I was also on the hunt for a narrow desk or vanity-like piece for along one of the walls. Loving the look of Chippendale-esq, faux bamboo (perhaps too many episodes of Golden Girls? Impossible: there is no such thing as too many episodes of Golden Girls! ), it was in the back of my mind that I’d find something like that. Not keeping my hopes too high, I just trolled and looked and waited. And, again, I scored. Evil laugh. The picture posted on Craigslist. Sorry for the shadow… but it was bad. Full of cat hair and dust. I had basically no interest in the chair, as it wouldn’t go in the bedroom. 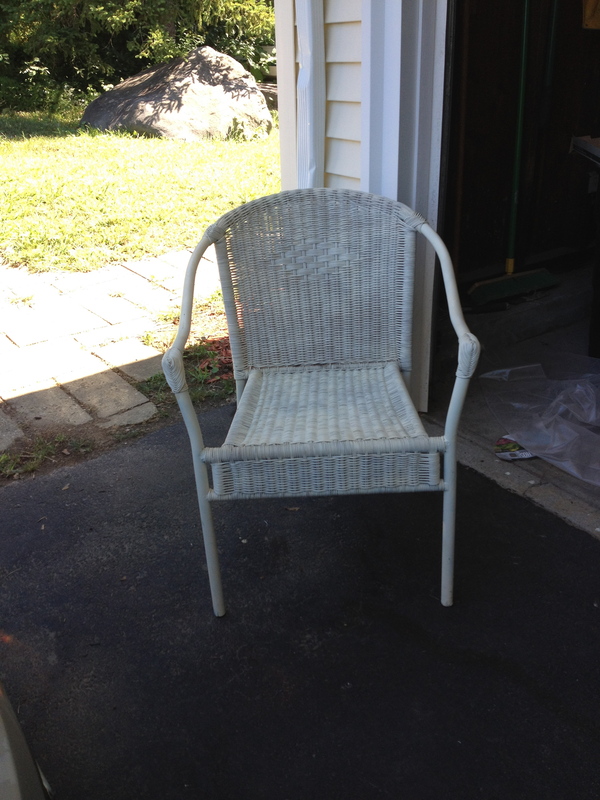 But I took the chair–the guy was desperate–and figured we’d either stick it in the basement or redo it. Yeah, we definitely still have a stripe of Cobolt Cannon grass. Still drying, but you get the idea. I’ll post true “Afters”–the pieces in their respective places–when I have those areas more organized. The top is thinly veneered and needs to be sanded down, but the rest is solid wood. My plan right now is to sand it down and stain it a dark teak color, then wax over it. This will probably go in the nook at the top of the stairs (under the window), or in the smaller bed room where the tall bookcase stands now.